Anarchists always appropriated means to spread anti-authoritarian ideas and struggles to feed the dialogue and subversive action. 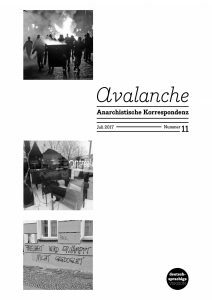 It is in this sense that this publication is also intended as a tool, more precisely that of providing a space to nourish the international debate between anarchists. That is why these particular pages create space for struggles that spring from anarchist activities; autonomous, direct and self-organized struggles; struggles that go towards the destruction of power in all its forms; struggles happening today, yesterday or that are announcing itself.